Aviation it seems is its own worst enemy. Yesterday I received numerous calls about a Stearman that had flipped at Reagan National and I just had to see it for myself. Yet when I went to look at it online I placed my head in my hands. You see, the circumstances leading up to the accident were rooted in the promotion of aviation. Like I said, aviation is its own worst enemy. This reminded me of the disaster known as "The Centennial of Flight". For those that don't remember it, it was a highly orchestrated event designed to showcase movie stars, a President, aviation alphabet groups, closed airspace and the Kitty Hawk tourism commission all in an effort to promote Ken Hyde, some military test pilots, and there was one last thing, what was it, oh yes, aviation itself. In the end, the airspace was closed because of a TFR that I believe was there to protect John Travolta, the site was standing with water from the ongoing rain, and the replica flopped into the mud on live TV. After all was said and done, it was the five seconds of the replica flopping in the mud that was aired around the world. In short, the best minds in aviation and Hollywood had produced a flop of mythical proportions. But why did this happen? Again, aviation is its own worst enemy. Instead of a clear minded group of professionals, aviation gathered a half wit team of people who first forgot why they were there and then set out to create a huge production. 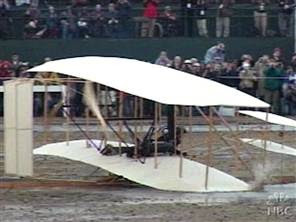 Instead of building a replica that had a few slight changes to the original design that would make it likely to fly, aviation decided it should place all its eggs in a basket that belonged to an exact replica of the original aircraft, that was lucky to fly in perfect conditions, while flown by the designers themselves. In the process, Ken Hyde got a lot of attention for his attention to detail, our alphabet groups got to tell us how important they are to us, a President was able to praise the freedom of flight while all others were grounded due to John Travolta's presence, and aviation got the shaft and the ticket. It was sooo bad, you would think executives from General Motors, Chris Craft, Harley Davidson, and the Association for Bringing Back Horses to Our Streets were at the helm. But no, it was the "best and brightest" in aviation. 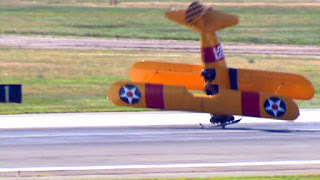 Move forward to 2010 where a Stearman is seen on national TV flipping and closing down an airport critical to our country's capitol. The headlines read "Promotional Stunt Closes Airport". Untold hours went into this event designed to promote a new IMAX movie about aviation, days or months must have been spent getting TSA approval, press releases were sweat over to get them just right before they went out to any media of any size, and in the end somebody forgot to remind these pilots and their passengers "DON'T SCREW THIS UP". Unfortunately, this is all too common in aviation. Yeah, I am the first to say accidents happen; really I am. But I also know that accidents are extremely rare when people are instructed as to how to keep an accident from happening, reminded of the importance of safety, and told they'll get their heads beat in if they screw up. My guess is that at the very most, somebody thought it would be important to brief the flight as to what order they would land and maybe some frequencies, but that's it. I can also say that when landing on Reagan National runway one with a fifteen knot headwind, there is no reason to be wheel landing, no reason to be touching the brakes, and no reason to be stacked so tight that each pilot couldn't focus on his or her landing instead of the plane in front or behind. Furthermore, there was no reason to have an inexperienced passenger on board who may or may not have had their feet on the brakes. Sure, I know some of you will say I am over-reacting, but I have to disagree. If aviation wants to get serious about promoting aviation, it needs to take these promotional events serious enough to insure these ridiculous screw ups on live national TV quit happening. "with a fifteen knot headwind, there is no reason to be wheel landing" There are pros/cons of 3-point landings and wheel landings. But I prefer wheel landings in higher winds. I'm sure most experience tail wheel pilots do since they can plant the plane down then control how quickly they slow down the plane. That does eat up more runway but that isn't a problem there. Windy days at Oshkosh or sun-n-fun, every aerobatic performer would land FAST doing wheel landings. Either would work but many factors determine which is best at that time. John thanks for the comment. Me myself I believe the airshow mentality is causing real problems in the tailwheel world. Several years back we studied the original factory manuals of tailwheel aircraft back when they were being built and flown by people who knew how to fly tailwheel aircraft. None of them recommended wheel landings. Even the T-6 Air Force manual said to land it in a three point attitude, wind or not. Having over 1000 hours of Stearman time myself, I can tell you that there was no reason to be wheel landing it. But as for wheel landing to fast taxi for the plane behind you, I mentioned that this was no place for that. All eyes were upon them and they should have been at their best and in their safest mode. What he could have done instead was landed long. But I suspect ultimately we'll find out nobody briefed the passenger about the hazards of focusing on video taping instead of keeping their feet off the pedals. Re the flip over of the Stearman at DCA, it has been admitted by the reporter riding in the front seat (though not in his nationally published article) that he tried to stand up in the plane so that he could see better over the cowling as the pilot was landing. Of course, there is no floorboard of the Stearman and the only place he had to put his feet was on the ruddar pedals. On intitial taxi at the departure/staging airport, the passenger had to be warned to keep his feet off the brakes. I guess he forgot all about this as he tried to get higher in the seat for a better view/photograph. He admitted post accident that he had put his feet on the brakes prior to the accident. Shame that aviation had to get a bad name because of this when it's really the reporter's fault. Rich, I couldn't agree with you more. 3 point is the way to go and this business of putting one's feet on the brakes seems to be a common problem. I hae only 4,000 hours in the model 75 Stearman and I've checked out a few guys over the years. To pull off a mess like this on national TV is just plain stupid. With that breeze blowing a nice 3 point would have looked sweet. I too have heard that the passenger may have had his feet up on the rudder pedals so as to boost his position for a camera shot. FOX news had a phone interview with the pilot/owner who stated somebody got on the brakes. Brakes??? I hardly ever used them except for the mag check and to stop at my parking spot. Are you really implying that if he had done a 3 point with his brakes locked he wouldn't have done "low level" aerobatics? What I am saying is that the likelihood of that accident happening would have been less. Wheel landings are rushed landings, they have an exponential amount of energy to be released in the accident, there would have been just a fraction more time to try to solve the problem, and with a fifteen knot headwind, the plane would have touched down in the high 30 to low 40mph range that might, and I stress might, have left them on their nose instead of their back. Not only am I a fan of tailwheel flying, I have studied it for years, and back when we still thought there was a chance you could talk sense into people, Ginger and I studied it heavily for a year. There is so much evidence to drive people away from wheel landings it is amazing you still see them. Our research dug up that wheel landings were added to the FAA training manual only after the National Sailplane Association insisted it be taught because from their experience, all their accidents were coming from people wheel landing. The FAA then put it in as “Normal and Wheel Landings”. Notice they said NORMAL. This is important. Even the FAA knew this. As for accident reports, most accidents where the type of landing was reported turned out to be wheel landings. Aircraft manufacturers who built these planes back when they built real airplanes and had pilots who knew how to fly them, instructed pilots, via their manuals, to land the plane in three point attitude. Air Force manuals for the T-6 even instructed pilots to land in a three point attitude and to learn this attitude by sitting in the plane while on the ground. And yet there is even engineering to back this up. Aircraft landing gear are built to track straight when in the three point attitude. Put one of these planes into a wheel landing attitude and you are trying to overcome the gear and the crosswind. And to add to this, tailwheels are steering wheels. And those that have a locking tailwheel are that way to act as a keel to help keep the aircraft straight. But there is something else nobody thinks about; the whole center of gravity. In a wheel landing the whole center of gravity of the aircraft is very high and likely to cause a plane to go on their back. Touch down in a wheel landing and touch the brakes and you are already a third of the way over with a high center mass that carries a lot of inertia. You also have a higher amount of energy to expel which amps up the ensuing damage. Insurance companies know this because that is their field of experience. The amount of energy in an accident goes up exponentially with every slight increase in speed. You goal is therefore is to touch down as slow as possible. Do so and you are much more likely to come away from human errors with a bruise free ego. My dad learned to fly in the Air Force in a T-6 in the 1950's and he said they were not taught wheel landings and never made them. Also, every landing was a power off glide with full flaps, and in a T-6 you're coming down good like that! Dad had a Stearman for years in the 50's and 60's, and a Cessna 195 (which I have now) for more than 40 years. He never wheel landed any of them, ever. Wheel landings are never "required" or "better." It's personal preference in the end. A properly executed "three-pointer", which to me is really a full-stall landing as you ought to work the stick back to the stop and stall it with the wheels 6-12" off the runway and the airplane basically drops onto the runway, a little tailwheel first (and keep that stick back in your gut during the rollout! ), provides the least amount of work during rollout if you have a steerable or locking tailwheel. An old guy that used to be in our QB hangar said when he flew the DC-3 for Eastern Airlines it was company policy to 3-point them...today most DC-3 pilots tell you it must be wheel landed. Where do they get these ideas? All ya gotta do is keep er goin straight and keep the feets on the deck. IS THERE SOMETHING THAT I CAN DO? Introducing Gilmore - Need a Kitten?